Featuring two variations, La Mezcla Cubana has quickly and quietly emerged as a player in the mild cigar space. The Cinco Anos Natural, the first offering, is a Nicaraguan puro aged for five years. It features a complex medium body and elegant taste consisting of pepper and unique spices for an exotic finish. It is wrapped with a Natural Nicaraguan seco wrapper. On the other hand, the Maduro, is a full body but is still elegant with pepper and spices leaving that smooth classic maduro sweet finish. The Maduro, like the Natural, is a Nicaraguan puro aged for five years. 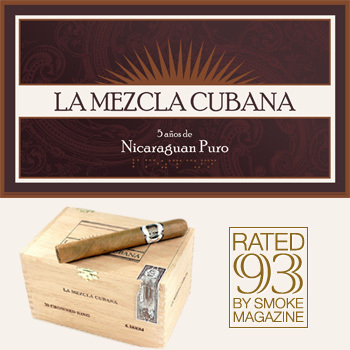 La Mezcla Cubana cigars come highly rated, especially the La Mezcla Cubana Titan cigar, which received a 93 rating and a review from SmokeMag.com saying that the "appearance and taste were terrific. I enjoyed them with Diet Coke and coffee. Might also pair well with a dark beer." Buy a box of La Mezcla Cubana cigars today and see for yourself.